This summer, the UW Department of Family Medicine and Community Health (DFMCH) said goodbye to 33 graduating residents. Of them, 22 (67 percent) entered practice in cities and towns across Wisconsin. The remaining 11 (33 percent) entered practice in eight states—from New York to Minnesota to Alaska. Find out below where they’re practicing and what they’re excited about in their new careers! 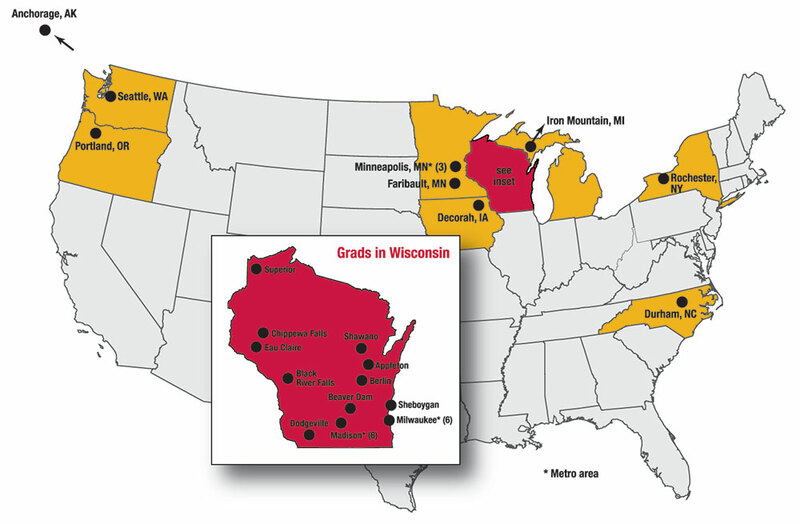 Of the 33 DFMCH residents who graduated in 2017, 22 entered practice in Wisconsin. The remaining 11 are in eight states across the U.S. Both Baraboo graduates have entered rural practice in Wisconsin. Abigail Puglisi, DO, is at ThedaCare Medical Center in Berlin, and Neil Cox, MD, is at Ho-Chunk Health Care Center in Black River Falls. Three of the five Eau Claire graduates have entered practice in northern Wisconsin. Gretchen Adams, DO, is at Essentia in Superior; Michael Braunsky, DO, is at Prevea Health in Chippewa Falls; and Lauren Sauter, MD, MPH, is at OakLeaf Clinics–Eau Claire Medical Center in Eau Claire. The remaining two graduates are close by in the Upper Midwest. Andrew Poulos, MD, is at Bellin Heath in Iron Mountain, Michigan, and Sakina Sachak, MD, MBA, is at Allina Health in Faribault, Minnesota. One at Access Community Health Centers William T. Evjue Clinic in Madison (Julia Weiser, MD). Academic Fellowship (Emily Torell, MD). Of the four residents leaving Wisconsin, two are entering direct practice (Catherine Nelson, DO, at Gundersen Decorah Clinic in Decorah, Iowa, and Jennifer Perkins, MD, at Southcentral Foundation in Anchorage, Alaska); and two are entering fellowships (Bonnie Garvens Brown, MD, at the Swedish First Hill Advanced Obstetrics Fellowship in Seattle, Washington; and Erin Peck, MD, at the University of Rochester Faculty Development Fellowship in Rochester, New York). One at ThedaCare Physicians (Jasmine Wiley, MD, in Shawano). Of the four who are leaving Wisconsin, two are in Minnesota (Sara Karalus, DO, at Allina Health in Inver Grove Heights, and Anne Lovell, DO, at Rice Street Clinic in St. Paul); one is in Oregon (May-Lynn Chu, DO, at Adventist Medical Center in Portland) and one is in North Carolina (Alyssa Krueger, DO, at Duke Primary Care in Durham). One Wausau graduate is remaining in Wisconsin: Tricia Gilling, DO, is at ThedaCare Clinic in Appleton. Her classmate, Alexandra Oleinik, DO, is staying in the region, at Park Nicollet Clinic in Brooklyn Center, Minnesota.